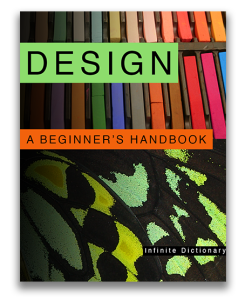 In December it will be three years since we published our book Design: A Beginner’s Handbook. In structuring that textbook we decided to use simple real-world examples of the design elements and principles. We opted to demonstrate the application of those principles in the worlds of art, design and architecture by posting on Facebook, Pinterest, and in this blog. Periodically I like to step back and reaffirm the connection between the book and the blog. The book was written for beginning art and design students, as well as for a general audience with an interest in the arts and a desire for a more in-depth understanding. Over the two and a half years we’ve published this blog we’ve covered the work of contemporary artists, written about the application of specific design elements and principles, provided design exercises, discussed artistic movements, added lists of resources – from artist’s residencies to free photographic websites, shown how to evaluate an individual work of art…the list just goes on. Some of our postings are written for beginners while others require more experience – experience which is available if you read our book and review a range of prior postings on our site. Today I’d like to encourage you to spend some time reading these earlier posts. If you haven’t already read our book you can download a free sample through Apple’s iBooks Store. This entry was posted in Resources, Uncategorized and tagged architecture, art and design exercises, art education, art education resource, art installations, Art Textbook, crafts, design textbook, Drawing, graphic design, painting, Photography, printmaking, sculpture, studio art. Bookmark the permalink.